The history of Odisha is a perfect compilation of different dynasties, which ruled Kalinga (Odisha). Historical information about the state is interesting, speaking volumes about the rich legacy of the state. 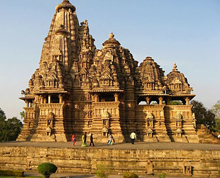 Odisha is referred as Kalinga or Utkal in ancient times. Kalinga was an independent kingdom blessed with prosperity. During 260 B.C Asoka, the great emperor invaded Kalinga. This war was a turning point in the life of Asoka. The Kalinga war saw huge loss of lives and bloodshed. This massacre forced Asoka to resort to Buddhism. Asoka, acquired other kingdoms using Dharmavijaya. Asoka preached Buddhism throughout his state. Rock-cut edicts at Dhauli, inscribed by Asoka in 260 B.C, are one of the earliest historical pieces of evidence. After many small rulers, King Kharevela of Mahameghavahana dyanaty came to power in second century A.D. Kharevela, a Jain ruler was involved in the expansion of his empire. He was efficient in his administration. Rock-cut caves at Khandigiri and Udaygiri, stand as testimony to his love towards Jainism. Kharevela was later succeeded by Gupta dynasty during 4’TH century. By the end of 5’TH century Gangas started their rule in Kalinga. Gangas were successful in bringing many small states under Kalinga kingdom. Gangas contributed towards development in art and architecture. King Narasimhadeva was one of the last successors of the Gangas’ dynasty. King Narasimhadeva was a great patron of art and architecture. History applauds him for the construction of World famous “Sun Temple” at Konark. The temple took twelve years of the state’s revenue for its making. 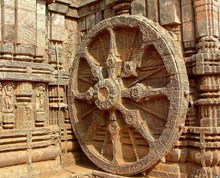 Stone was intricately carved to make the chariot with four gigantic wheels, having idols of Sun God in four directions. Kapilendradeva, of Surya dynasty overthrew Gangas using force. They were initially feudal chiefs of the Gangas. Kapilendradeva defeated Sultan of Bengal, who invaded Kalinga. Kapilendradeva had immense faith in Hindu religion. He is said to have built the walls of the famous Puri Jagannath temple. Prataprudradeva of Surya dynasty succeeded in having his empire extended from Krishna to Cauvery. During his tenure, King Krishnadevaraya of Vijayanagaram invaded Kalinga. Prataputradeva reached an agreement with him and gave his daughter Jaganmohini in hand with Krisnadevaraya. The Chalukyan dynasty followed the Surya dynasty. King Mukundadeva came to power in the year 1559 by deceit and bloodshed. King Mukundadeva entered into a treaty with King Akbar to drive away Sultan of Bengal. This attempt was not helpful to him, as the Afghans of Bengal later conquered him, in the year 1568. The Afghans of Bengal did not rule over Kalinga for a long tenure. They were overpowered by the invasion of Mughals. King Aurangazeb took over Kalinga, as it proved alluring with its rich reserves of wealth. There was a lot of unrest during the Mughal rule in Kalinga. Nawab of Bengal took over Kalinga from the Mughals. However they eventually handed the reigns to Marathas in the year 1751. Raghuji Bhonsle-I was the first Maratha ruler of Kalinga. He paid utmost attention to the welfare of the people. Taxes were collected and the revenues were used to improve the standard of living of the society. Bhonsle divided Kalinga into two regions for administrative purposes. The Maratha rule did not last for more than half a century. British took over Kalinga in the year 1803.Odra (Kalinga) was later referred as Odisha in its anglicized version. The British who came to India to establish trade, grew to become the rulers. Lord Wellesly, Governor-general of the British waged war against Odisha. There was a lot of upsurge and unrest during the British rule throughout India. Odisha was not far behind, as it began its revolt against the British. Situation turned worse during the 1865 famine. Poverty and hunger claimed many lives in Odisha. Many literary writers like Madhusudan das, Biswanath Kar, Ramasankar Roy staged nationwide protest thru their writings. India gained independence from the British in the year 1947. Post independence Odisha was not in its full form until Sardar Vallabhai Patel intervened. Odisha became an independent state in the year 1949. Oriya is the state language. The history of Odisha is legendary with great contributions in all arenas. Odisha rich in natural resources and potentials has a promising future.